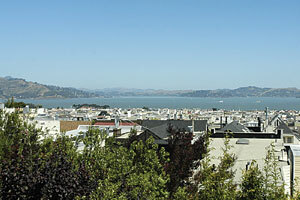 Enjoy the wonderful views of the Bay and Marin headlands from this fine residence, perched high on Pacific Heights. Its ambience exudes comfortable elegance amidst beautifully proportioned rooms with classic revival detailing and finely crafted millwork. The private front terrace and beautifully landscaped north garden provide additional pleasures for ample outdoor entertaining. 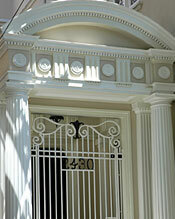 Handsome entry way with classic architrave, coach lantern and carved wood door. Natural light floods the elegant VESTIBULE which features an oversized skylight, classic revival pilasters, limestone floor & seasonal blooms set in handsome flower boxes. The spacious and inviting CENTER HALL introduces the fine architectural proportions found throughout the main level including high ceilings, wide doorways, picture windows, gleaming hardwood floors & halogen recessed lighting. A beautiful stone fireplace with deep alcoves on each side graces the elegant LIVING ROOM. French doors open to the private and sunny terrace, screened by lush greenery–a perfect place for guest entertaining. The formal DINING ROOM seats twelve or more guests and opens to the adjoining view SITTING ROOM for intimate conversation and enjoyment of the landscaped garden and sparkling Bay view. The remodeled light & bright KITCHEN with BUTLER’S PANTRY features granite counters and glass front cabinets. Breakfast area with picture window water views. Appliances include: Dacor 6-burner stove with double ovens, Subzero refrigerator/freezer, ventilator, microwave oven, dishwasher & disposal. Ascend the gracious staircase to first bedroom full floor. 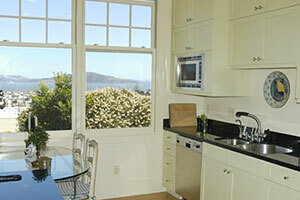 Enjoy impressive views of the Bay, Alcatraz Island & Marin headlands from the spacious private MASTER SUITE. 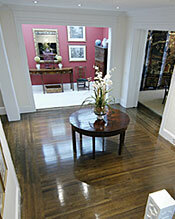 Luxuriate in His and Her BATHROOMS, each with custom walk-in DRESSING ROOMS. Sunny & spacious BEDROOM may also serve as a MEDIA ROOM with built-in media center, cherry wood wet bar & icemaker. Full BATH adjoins. Three charming gabled BEDROOMS (one with Bay view) and full BATH. The lower level is accessible via the main staircase. 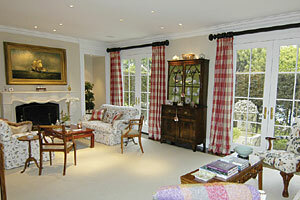 SITTING ROOM with art glass window and designer POWDER ROOM with pedestal sink at mid-landing. Trades entrance off the driveway, as well as from the garden and the garage. 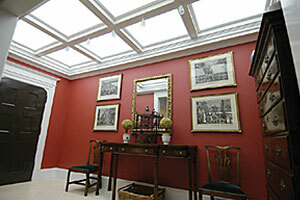 The spacious view MULTI-USE ROOM may serve as a play or media room, at-home office and exercise room. 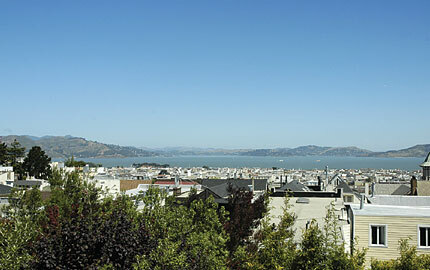 Connected is au pairs quarters with a separate entrance which consists of bedroom & bath. LAUNDRY ROOM, mechanical room & additional storage. TWO-CAR SIDE-BY-SIDE GARAGE with a driveway shared with the property to the east. 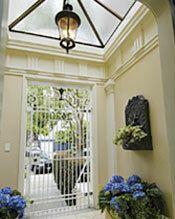 Beautifully landscaped, sunny & private NORTH GARDEN.